I have few pieces of fruit left, some vegetables in the fridge and a bit of yogurt. What can I do to get a healthy breakfast for an early energetic boost? Smoothies: Healthy Recipes has all of your answers a simple fingertip away. For some people, fruits or vegetables are the most delicious food on earth, but for others... well... not so much. Especially green vegetables. So picture it this way. 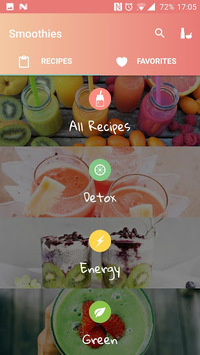 This app offers you the best smoothie recipes that combine those vegetables that are even healthier than fruits, offer increased nutrition and provide you the magical way of consuming vegetables without realizing it! And the most important thing is that the final outcome is delicious! Voila! 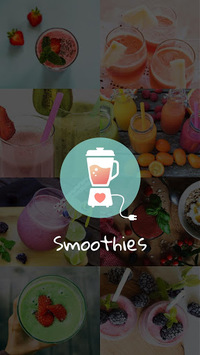 This app has a huge collection of 150+ smoothie recipes from around the globe. It’s very easy to navigate and find your tempting smoothie recipe and start preparing it immediately! 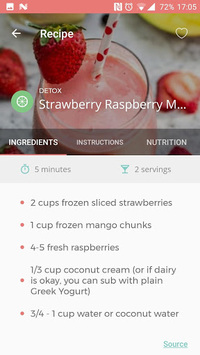 Beside the healthy menu to choose from, there is an option that allows you to search a smoothie by indicating the ingredients you own and the app will tell you all the smoothies you can make in a second! All recipes are illustrated and for each one you can find the ingredients list, nutritional value and instructions for preparation. The app does not require internet connectivity so you can use it anywhere you like, anytime. It is constantly expanding to add new features and recipes, so stay tuned! Check it out right now to find out which smoothie you like the most! All recipes, text and photographs in this app are credited to their authors. Please address any copyright concerns to the developer email below.